The 2017 event, which was clearly the best attended and most vibrant of the current four-year Chicago run of AXPONAs, will be last in this highly successful series to be held at the Westin O’Hare. Starting with the 2018 show, set for April 13–15, AXPONA will have a new home, some 11 miles northwest, at the Renaissance Schaumburg Hotel and Convention Center. Part of the reason for the move is AXPONA’s continued, significant growth. Stats show that paid attendance was up over 13%, with an increase in exhibitors as well. As big as this show has gotten, it is simply impossible to cover it in the three short days it runs. I can’t imagine how we will manage next year. But, it has become a very, very good show. Volti-Audio introduced its new three-way horn loaded Rival ($7,900–$11,000/pr. based on finish)—a more compact, affordable version of its impressive $26,000 flagship Vittora. The Rival uses Tractrix flared wooden horns for both midrange and tweeter in tandem with a 15” high-sensitivity woofer in a bass-reflex configuration. The Rival was powered by Border Patrol electronics, either version of its SE DAC ($1350), EXT1 preamp ($13,500), and SE300B EXD power amplifier; all cabling was by Triode Wire Labs, including its $299 digital interconnect, $349/pr. single-ended interconnects, $599 speaker cables, and power cables starting at $399. With a wonderful balance, pure and vibrant tone color, good texture and space, and near faultless dynamics, the Rival is a pure pleasure to hear in its price range. 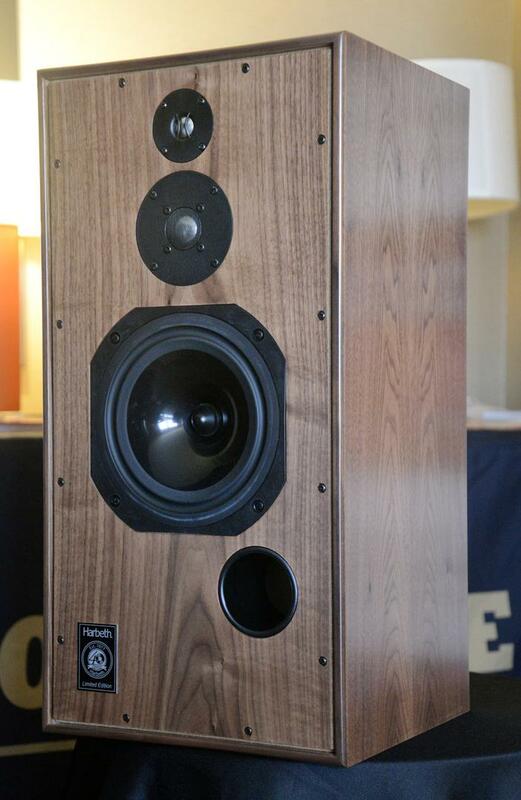 The 40th Anniversary Edition Harbeth HL5 Plus ($7495/pr.) was a clear standout. This edition, celebrating 40 years of speaker building, includes WBT Nextgen binding posts, a new super-tweeter, and UK-made polycapacitors. Driven by all Vinnie Rossi electronics, including the LIO “Super Integrated” system ($11,675), which combines the LIO DHT linestage, LIO MOSFET amp, LIO phonostage, and LIO DSD/PCM DAC, the Harbeth system was remarkably musical. Strengths here included especially faithful tone color and texture, with intricate yet undeniably accurate layering, soundstaging, and imaging. TAD introduced its new Micro Evolution One, which uses a new 3.5” CST (Coherent Source Transducer) driver, a smaller version of the well-regarded 5.5” CTS used in the $24,000 Compact Evolution One. Designed to cover the bandwidth from 420Hz to 60kHz, the coaxially configured midrange and beryllium tweeter have been designed to eliminate comb-filtering. Using non-woven materials that are separately formed then laminated on Aramid fabric, the 6 1/4” woofer diaphragm is built to offer low internal losses as well as outstanding linear drive characteristics. Using the $6500 Dr. Feickert Blackbird Deluxe 12 ’table, $9500 Koetsu Urushi Sky Blue mc cart, $10,000 BAT VK-P12-SE phonostage, the $29,000 TAD Laboratories C2000 preamp, $24,000 TAD Laboratories Power Amp, and Nordost cabling, the Micro Evolution One sounded extended at both ends, with exceptional weight for a mini-monitor. Piano was gorgeous, lush, and clearly very dynamic. A stirring success! Andrew Jones featured his new $2500/pr. 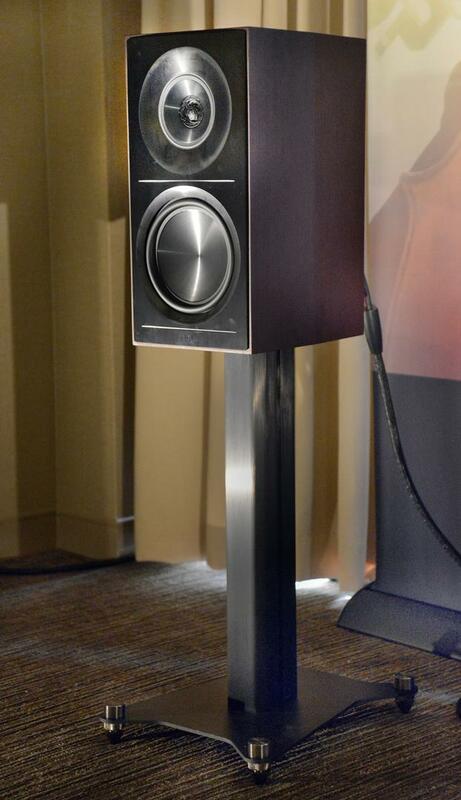 Elac Adante AS-61 monitors, with their $599/pr. dedicated stands. 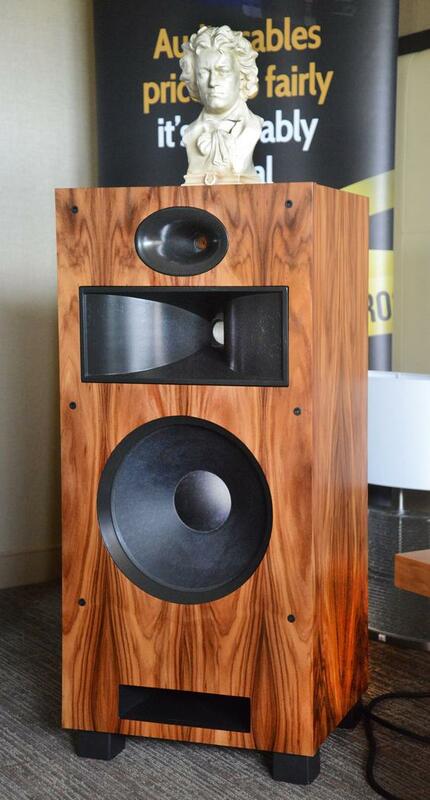 At first glance, you wouldn’t know that these speakers are as special as they are. A second look shows no ring for the voice coil attachment on the 6½” woofer, which employs a coupled cavity approach (first used by Jones at KEF in the 1990s), in which an active driver sealed in an inner chamber drives the acoustically coupled driver on the front baffle, which is actually a non-powered passive radiator. In conjunction with the $1099 Elac Discovery Music Server DS-S101 or the $1795 Audio Alchemy DMP-1 Digital Music Player with the $599 Audio Alchemy PS-5 Premium power supply, the $1995 Audio Alchemy DDP-1 DAC/Pre-Amp, and a pair of $1995/ea. Audio Alchemy DPA-1M mono amplifiers, with Shunyata power cords plugged into the $4995 Shunyata Denali D6000T power conditioner, and AudioQuest interconnects and speaker cables, and all sitting on a $379 Solidsteel S2 rack, the Andantes were stunning. With almost unbelievable extension at both ends (and something like 36–38Hz on the bottom), spot-on tonal color, vibrant, utterly natural mids, and enough resolution and transparency to make you wonder if they might actually sell for three times the money. 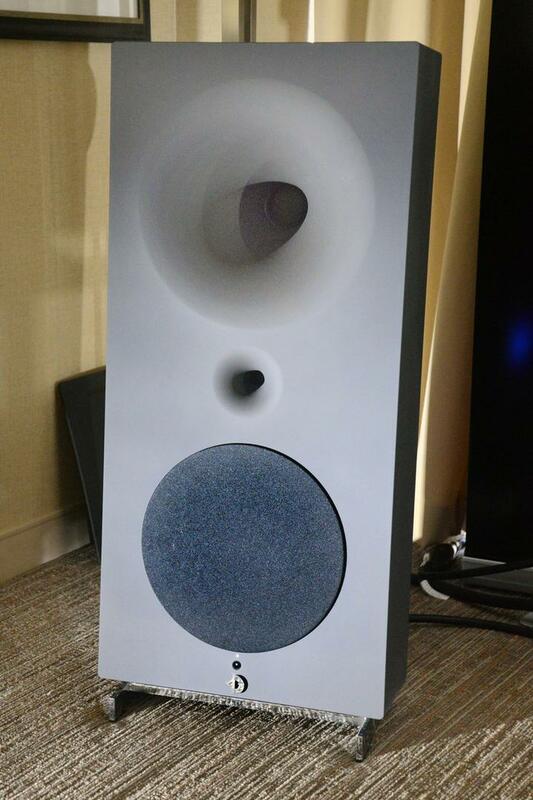 Finally, Avantgarde Acoustic introduced the $15,000 Zero TA, a semi-active version of its highly successful Zero 1. Essentially, the TA eliminates the preamplifier, DAC, and built-in amps for the tweeter/midrange, allowing owners to simply connect their existing stereo system. Sources were either the new $34,000 Danish Bergmann Galder turntable and Odin tonearm (with vacuum hold-down and air bearing for both ’arm and platter) fitted with the new $6000 Phasemation PP2000 mc phono cartridge, hitched to the revised $10,000 Sutherland Phono Blocks or the $5500 Aurender A10 music server/DAC. The $16,500 Avantgarde Acoustic XA integrated amplifier (1.1W Class A/150W Class AB), drove everything via Transparent XL cables, while resting on HRS racks or platforms. This system offered exceptional bass coherence, with frightening dynamics, superbly neutral balance, and accurate musical scaling. While staging, left-right and top to bottom, was accurate, depth was fairly shallow, though that clearly could have been the room or the setup. Bruno Putzeys’ Kii Three speaker is a remarkably clever and advanced product, one that fits any space, works in any space, and requires nothing more than a source to be fully ready to go, never sounded better. Each channel of the Kii Three is its own compact DSP-controlled monitor speaker, using four 6.5" woofers (one each on the left, right, and two on the rear), and a single 5" midrange and 1" wave-guided tweeter on the front baffle. Further, each contains six channels of DSP, D/A conversion, and amplification. So, all in, we are dealing with six 250W full-custom Ncore amplifiers, and Active Wave Focusing crossover filter for best possible time coherence and minimum phase response. Focus and dynamic contrasts were not unlike those of a decent horn system. These six powered woofers have the ability to knock you out of your seat, and come close to the equivalent punch and snap of some of the finest loudspeakers I’ve heard. Tonal balance was spectacularly well done, if a bit to the brighter side of natural, with the upper mid's accentuated ever so slightly. However, the amount of accentuation varied noticeably with each song played, so it may have been an attribute of the source recordings. 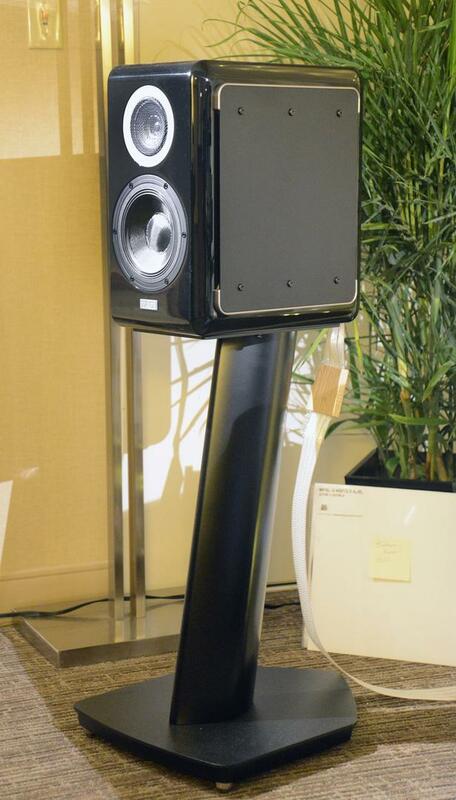 Without doubt, the most amazing surprise at this event came in the $7495 Atohm GT 2.0 HD loudspeaker. Other than its exquisite piano-gloss rosewood finish, this small tow-and-a-half-way floorstander from France gives no hint of its exceptional performance. Listening to “Calypso Minor” from Abdullah Ibrahim’s Sotho Blue, I was treated to some of the most engaging, accurate, and exciting sounds I heard all weekend. Sourced from a $4000 NAD Master M50.2 streamer, driven by the $4299 French Atoll IN 300 integrated amplifier with DAC, and wired with Transparent Super interconnects and speaker cable, the Atohms delivered excellent transparency, exceptional extension at both extremes, with remarkable air and an almost unbelievable sense of the space of and around instruments. Tonal color was spot-on, while texture and dimensionality were almost reach-out-and-touch real, making pianos, strings, and horns uncannily realistic. Dynamics were excellent for a system with drivers this size, and their ability to scale up as the volume increased was nearly unparalleled in my experience. The first product you encountered entering the Legacy suite was a longtime standard, the exceptional $11,495 Legacy Focus SE. With its 4” dual Air Motion Tweeter (AMT) and 1” Kapton super-tweeter, pair of 7” silver/graphite woven mids, and pair of 12” spun-aluminum woofers, this six-driver, four-way speaker left no doubt as to why it has survived the test of time. Beyond its ability to render wonderful tone color and texture, it offered authentic and realistically sized soundstaging as well. Klaus Bunge's Odyssey electronics have long represented the best buy for the money. But this was the first time I had opportunity to really sit down and listen to his new floorstanding monitors, the $4200/pr. Kismet. Sourced by the $29,000 VPI Avenger, fitted with a $6000 van den Hul Calibri cart, and using the $1950 Odyssey Suspiro phonostage, a $10,000 Symphonic Line Reference linestage fed the $1995/pr. Khartago monos. What the Kismets give up in absolute extension, resolution, and transparency, they more than make up for in focus, tonality, body, bloom, and involvement. They are extremely natural. The new Markaudio-Sota Cesti T is something unique at $3495. Using what Markaudio terms an “all range” driver approach, the Cesti T employs a pair of 4.4” drivers and a single 2” driver. These wide-dispersion shallow-profile cones replace conventional cone-woofers and dome-tweeter combinations. The aim is to afford that rich midrange attained by single-driver designs, yet still provide a full-range (40Hz–25kHz) experience. Sourced by a $595 Marantz CD6006 and driven by a $1495 Jolida 1501 integrated, using nondescript cabling, the Cesti T offered surprising weight, nice tone color, good pace and flow, with a slightly lightish overall balance. As they were awfully close to the wall, it would be my hope that focus and staging would improve significantly if they were set up a little better. Another room that left me wishing I had the time to sit longer and take it in was sponsored by Knut Skogrand, of Skogrand Cables. Sources were the $13,000 J-Corder Technics 1520 reel-to-reel or the brand new, drop-dead gorgeous $6500 VPI Prime Signature ’table in African rosewood, with the $4000 Ortofon Windfeld cart. ModWright electronics filled out the rest of the system, including the $7800 PH150 Reference phonostage, the $2900 SWL 9.0 Anniversary tubed linestage, and the $8495 KWA 150 SE amplifier, driving the new $16,450 Daedalus Poseidon v.2. Everything was connected with Skogrand cables, featuring the new entry-level Vivaldi interconnects ($750/2m length) and matching Vivaldi speaker cables ($850/3m length), also making their debut at this event. This new Daedalus Poseidon v.2 just lays tonal color bare and can flesh out texture and unravel space like little else in its price range. And if you are into natural wood finishes, the look is to die for. 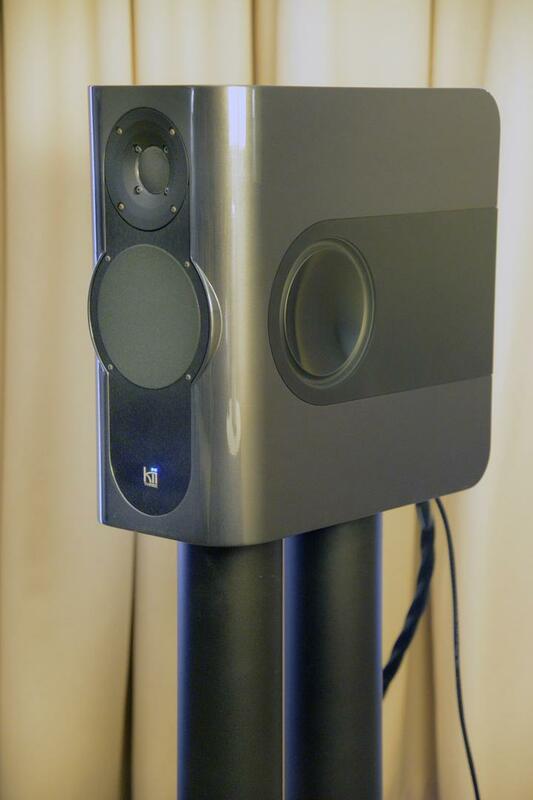 This is the most natural-sounding speaker I’ve yet heard from Daedalus. Best Sound (cost no object): The premier of the $295,000 Von Schweikert Audio Ultra 11, using all VAC Statement electronics and Kronos analog, takes over as the most musically engaging, organic sound I’ve ever encountered at a show. 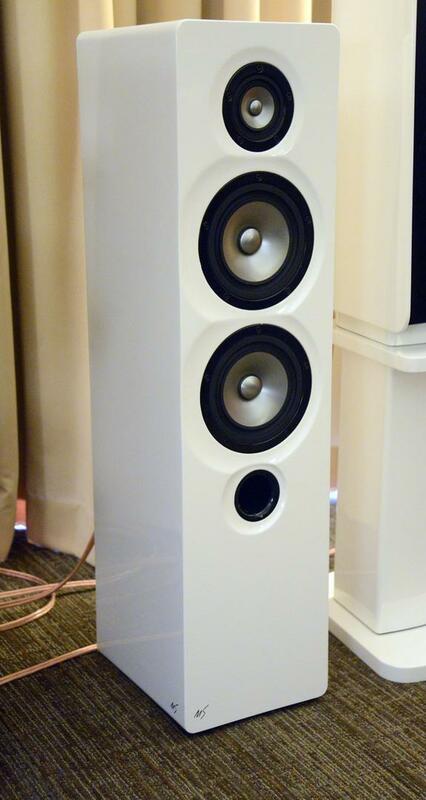 Best Sound (for the money): Andrew Jones’ new Elac Adante AS-61 monitors, with their dedicated stands, and all-Audio Alchemy electronics is a no-brainer. Superb performance for the price. Most Significant Product Introduction: The Von Schweikert Ultra 11. Its resolution and transparency, combined with its utterly natural, organic sound, takes the honors as the best show introduction of any speaker since the Magico Q7. Most Significant Trend: How many rooms were playing “Hey Now,” from London Grammar’s If You Wait release and the continued increase in open-reel playback. Most Coveted Product: Ummm, the Von Schweikert Ultra 11. Someone, please wipe the drool from the corners of my mouth.